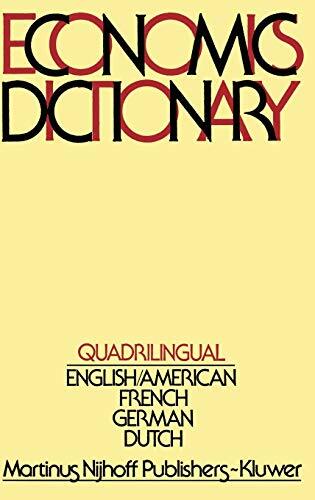 This quadrilingual economics dictionary is the result of many years of work. Professor Frits J. de J ong gathered material for this book since the very beginning of his professional career in the final years of the forties. Unfortunately, the author himself was not able to see the final result of his labours in book form. A mere few weeks after the completion of the manuscript, in November 1976, Professor De Jong passed away. As Hartog and Hennipman wrote in their memorials, Frits de Jong always devoted much attention to the development of concepts and terminology. Throughout his career, he exhibited great determination and perseverance in trying to achieve a clear and consistent terminology, and its subsequent use, in the science of economics. !' 2 That his efforts were mainly aimed at his native language was due to the fact that a language such as Dutch, which is only practiced in a small geographic area, faces the danger of a large-scale introduction of foreign words, specifically English/American, German and French words in this case. He always strongly resisted such a debasement of the Dutch language and sought instead to construct appropriate Dutch words for the existing English, German and French ones. An early example can be found in an article published in De Economist of 1950, entitled "De economische terminologie in het Nederlands" (The Terminology of Economics in Dutch). Simon K. Kuipers is professor in Macroeconomics and presently Chairman of the Executive Board of the University of Groningen. He is the Honorary Editor of De Economist, Quarterly Review of the Royal Netherlands Economic Association.